By giving a subscription, you'll provide a year of inspiration, encouragement and creativity. Planning on purchasing multiple gift subscriptions? You can only use one shipping address per order so each one needs to be a separate transaction. The recipient's address is entered in the shipping fields and yours in the billing. Thank you. Single copies of issue 39 are available to ship now. Please be aware of shipping deadlines as listed on this page. Order a Gift Subscription starting with issue 40 (Jan/Feb/Mar 2019) and it will arrive with your recipient by early January. Please have the recipient's current and correct mailing information at hand. If you're renewing for someone, make sure you're using the same name as the original subscriber. You can only purchase one subscription at a time, so if you're subscribing or renewing on behalf of multiple people, please do a separate transaction for each recipient. 1. Select the gift subscription starting with issue 40 (Jan/Feb/Mar) issue. If you're not planning on purchasing anything else for this recipient, you can proceed to make your purchase from this page. If there are other things you'd like to add to this gift, then please go to our main shop. These other items will be shipped immediately to the RECIPIENT’s address. If you want to ship something to yourself, please do a separate transaction, thanks. Money-saving tip: If you purchase a two-year subscription, you'll save $30 automatically! 2. Select the option according to your recipient's country. One-year subscriptions mailed in North America are $80, mailed internationally, they're $120. Our store and checkout is in Canadian dollars, so use the currency option in our main shop to view the approximate price in USD or GBP or Euros or Australian Dollars. Rest easy knowing that our cart is secure and we do not see or record your credit card details. 3. Proceed to the checkout process and enter your name, address and email address in the billing fields and include the recipient's name and mailing address in the shipping fields. If you added anything extra, the cart will calculate the shipping costs. You'll get emailed the tracking information if you're purchasing anything that is shipping asap. You will receive a confirmation of your order. If you want to purchase a gift subscription for someone else, just repeat. Thank you! Click here to download a pdf that you can print or email to your recipient. Please note that UPPERCASE cannot send electronic or printed gift messages. 1: Purchase a Gift Subscription starting with issue 40 (for orders placed after December 5, your recipient will receive issue #40 in January). 2: Download and make these free printable gift tags and or email this graphic to your recipient. Back issues, books and more! Browse our main shop for more. Click here to download gift notices, cards and wrapping paper. Please note that when ordering a gift subscription, the cost of standard delivery by USPS or Canada Post is included. If you are ordering after the cutoff dates below, you will have to select an upgrade in shipping to expedite the delivery. *Postal delays are beyond our control; these dates are a rough guide only and we cannot guarantee the expediency of your local postal service. December 7th: last day for international orders to be sent via standard USPS international to Europe, Mexico, Asia, Australia, New Zealand, Africa and the Caribbean. This 368-page book features profiles of 48 designers, artists, artisans and entrepreneurs who make things with print. It has a dust jacket that can be folded to reveal one of four designs. Or you can use the dust jacket as gift wrap, collage or for another creative project. 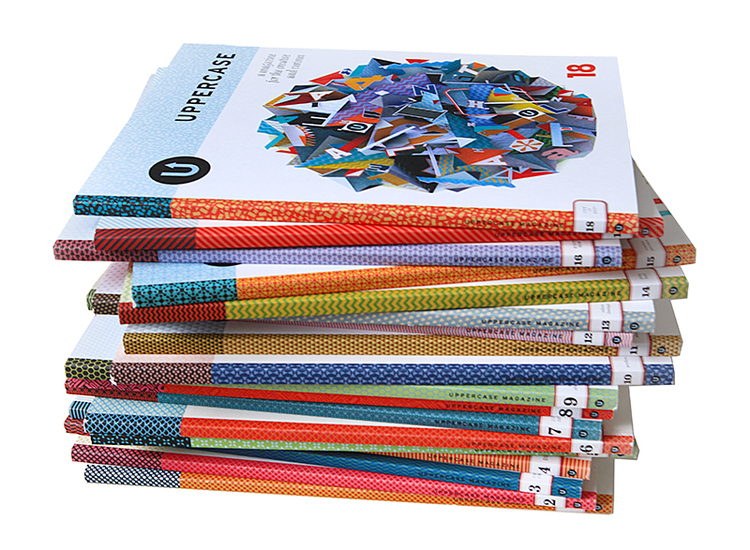 Work/Life 3: the UPPERCASE directory of illustration. With the third book in this series, we explore the illustrator’s lifestyle in intimate detail and find out what it takes to stay creative 24/7. Featuring 100 artists from around the world. Soon to be a collector’s item! Nearly out of print! A richly illustrated book full of never-before published typewriter memorabilia, intriguing historical documents and entertaining anecdotes, The Typewriter: a Graphic History of the Beloved Machine is a beautiful ode to an all-but-obsolete creative companion. A gorgeous gift book all about how florals and botany inspire all variety of creative people. 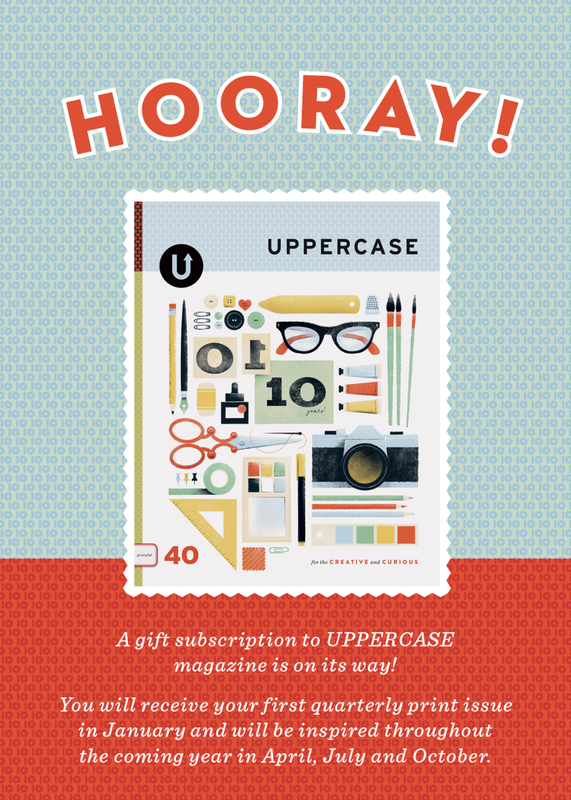 Back issues are an affordable way to give the gift of UPPERCASE. Our content is not time sensitive and each issue is bursting with inspiration. Not sure? Get them a Gift Card — they don't expire and can be used for books, subscriptions and back issues.